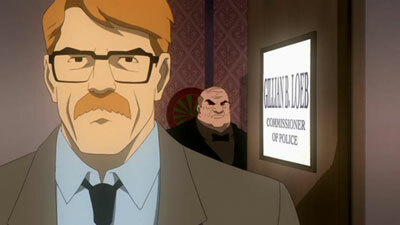 Lieutenant James Gordon joins the Gotham City Police Department, only to find it riddled with corruption. As an honest cop with a child on the way, he badly needs an ally. He gets one who wears a mask and a cape. The Batman character can be described historically in a variety of ways. One such way that remains quite relevant is to cite the character’s development as “pre-Miller” and “post-Miller.” While Denny O’Neil and Neal Adams brought back the “dark knight detective” angle back in the 1970s, thereby rescuing Batman from being solely a camp icon, Batman could still be viewed then as a comic book that kids could enjoy. 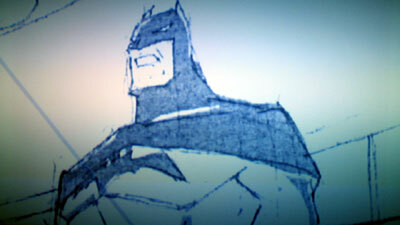 Once Frank Miller hit the character, though, Batman grew up in a hurry. 1986’s Batman: The Dark Knight Returns was a tour de force of sophisticated storytelling that practically invented the “grim and gritty” movement in comics. Even as a teenager, I felt like I was reading something that aimed high and I could certainly see that it was something that young and even older adults could be drawn to. This tale of an aging Batman finding his place again in the world gave comic books a huge shove into the public spotlight (along with a handful of contemporaries like Maus, Swamp Thing, and Watchmen) and spawned hundreds of “comics aren’t just for kids anymore” articles (though the articles still hopelessly clung to the tired “Biff! Zowie!” headlines). 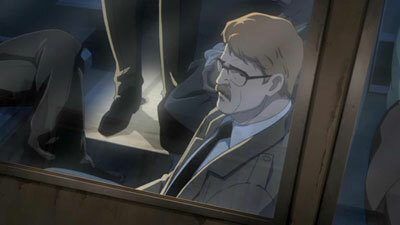 While The Dark Knight Returns could be viewed as a possible fate for Batman, Miller’s follow-up would firmly establish who the character would be for modern continuity. 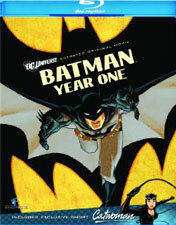 Batman: Year One came out in 1987 as four regular issues in the monthly Batman comic book. It drew back the curtain on what Batman’s first year operating in Gotham City consisted of, before the costumed psychopaths took over the crime scene. 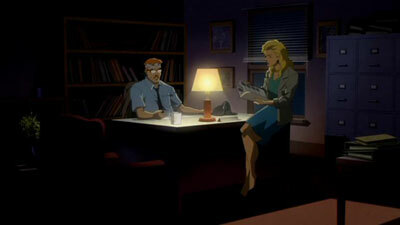 Miller only produced the script this time, with David Mazzuchelli on art. Mazzuchelli’s line work for this story could be viewed as minimalist at times, but was deeply rooted in realism. His sophisticated use of light and shadows recalled the work of comics master Alex Toth, while colorist Richmond Lewis provided an unusual color palette that made the overall look unique and noir-ish. 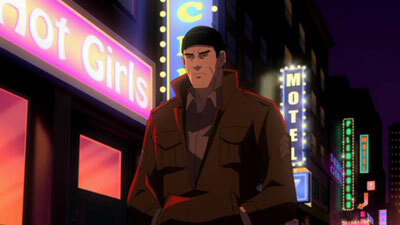 Miller’s use of adult themes, such as infidelity and prostitution, was relatively unique for its time in the mainstream comics world, and the story’s immense popularity ensured that Batman would be enjoyed evermore by a very broad readership. It is no exaggeration that without Miller’s stories, there would be no Tim Burton Batman and no Christopher Nolan Batman Begins. 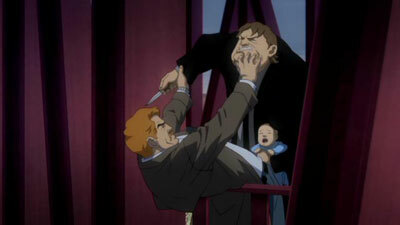 Without Burton’s films, it is also unlikely that Batman: The Animated Series and its countless spin-offs and follow-ups would have existed in the same form. Likewise, we would never have read Jeph Loeb’s Batman: The Long Halloween, and all of today’s Batman comics would be vastly different. Miller laid the groundwork for whatever came next. Warner Premiere’s line of DC animated movies also takes its latest inspiration from Miller, with a direct adaptation of Batman: Year One. The PG-13 rating allows Miller’s story to stay largely intact, with only the 64-minute runtime creating some compromise. The film, like the comic, takes place over the period of a year, jumping ahead sometimes weeks at a time, but still managing to hold onto a tight narrative. The near-simultaneous arrival in Gotham City of both police lieutenant James Gordon and returning Gothamite Bruce Wayne comes at a time when the Gotham police force is full of corruption, and in bed with the city’s racketeers. The tale more closely follows Gordon than Wayne, functioning as a crime story with a flawed protagonist. As the most honest cop in Gotham, Gordon struggles to bring ethics to the force, and finds himself in conflict with his fellow officers and his boss. He places his own life in danger, and even fears for the safety of his wife and unborn child. Gordon is trying to bring down the city’s rackets, but even the police commissioner is working with the crime bosses. 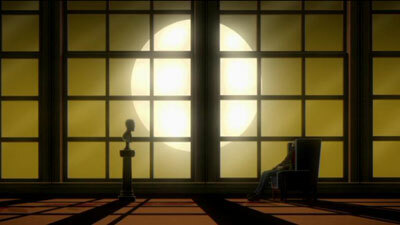 It seems a hopeless situation, with one man trying to make a difference, in a city without hope. But then Batman arrives on the scene. 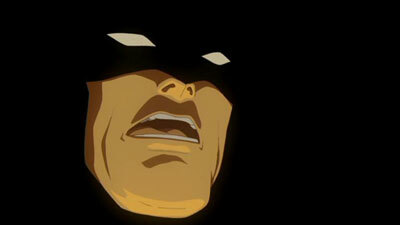 Bruce Wayne doesn’t become Batman immediately, though. His first attempts at vigilantism are clumsy and only barely successful. Wayne begins to feel desperate for inspiration, knowing that he has the skills to bring his one-man war on crime to Gotham, but he is lacking… something. Finally, one night while ruminating in his study, a bat crashes through the window; and Wayne then knows what his destiny is. Dressing up as a bat may be a gimmick, but it’s an effective one. Supernatural urban legends sprout up about the mysterious Batman, and at first even the police commissioner thinks it’s okay that Batman takes down a few small-time operators, as it makes the citizenry feel safe and less likely to ask questions about its police force. However, when Batman’s true task becomes evident, that he is in fact taking on the mob, then the police begin to take more notice— especially when Batman begins to help Gordon go after the crooked cops. This is simply a great movie. By placing the spotlight on Gordon, we experience Batman from the standpoint of those who first saw him appear, and we gain better insight into the difficulty the two men truly faced in bringing down the corrupt police department as well as the mob. This is a story that could not have been told wholly from Batman’s perspective. In any event, Gordon is much more relatable. He’s a man who just wants to do what’s right, but sees nearly insurmountable barriers in his way. He deals also with the temptation of having an affair (while his wife is pregnant, yet), and has to contemplate his own weaknesses. The entry of Batman into the picture proves to be Gordon’s salvation (not to mention the city’s), and the result is an alliance of two honorable men, as well as budding hope for Gotham City. In a great story well told, the only real weakness is Selina Kyle, who takes on her Catwoman identity during the course of events. The fact that Miller made her a prostitute, with a young charge named Holly, is somewhat interesting; but I never felt that either the comic or the film did a whole lot to make Selina’s story essential to the greater plot. She does interact with the other characters, but the story could have gotten on just fine without her, too. 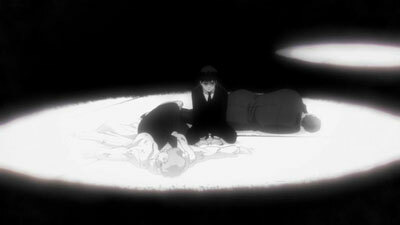 The art for the animation is wonderfully drawn. It doesn’t really look like Mazzuchelli’s art, with thinner and more detailed line work; but the realism is there, and evokes Mazzuchelli despite not following him fully. (The exception is the use of photographs, which always cleverly reflect Mazzuchelli’s style.) The Moi Animation artists handle the realistic drawing beautifully, making for what may be the nicest looking and most consistent of the DC animated movies. The animation is fluid when it has to be, showing good choices in regards to when to put the money on the screen. The voice cast includes Bryan Cranston as Gordon, perfectly bringing weariness to the role, mixed with enough strength that you want to see Gordon come out on top. Ben McKenzie’s Batman sounds a little too old and gruff, but I like his Bruce Wayne fine. 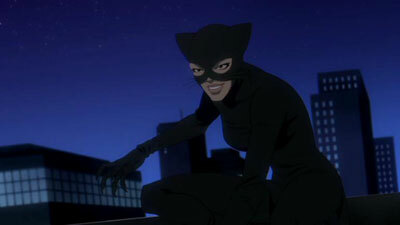 Eliza Dushku is Catwoman, Alex Rocco plays Carmine Falcone (I find Rocco’s voice almost too distinctive, but also wish that they’d cast him as something other than a gangster already), Jon Polito is Commissioner Loeb, and Katee Sackhoff does fine in her brief time as Sarah Essen, the object of Gordon’s desire. 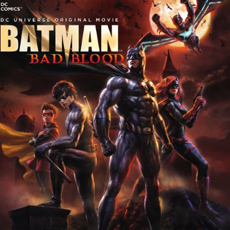 Of all the DC animated movies to date, this one ranks near the top. Its brief runtime does not particularly work against it, as the script is structured well to accommodate it. The animation is terrific, the voice acting generally strong, and even after all these years the story works mostly beautifully. This is an excellent primer for what Batman is all about, though beware the PG-13 rating, as the adult themes make this one a little risqué for youngsters. If you still feel that 64 minutes is too short to consider a purchase, you might feel differently once sitting through all the special features on this disc. The headliner is the DC Showcase: Catwoman short (14:50), whose length exceeds that of most of previous Showcase shorts, so you can see how the budget for this disc was split up. The Catwoman in this short reflects the Darwyn Cooke design rather than the Mazzuchelli one seen in the main feature, though I’m not sure Darwyn ever pulled Selina’s zipper down as far as it goes here. It’s a good story about Selina following a trail begun by discovering crooks chasing a cat wearing a necklace, but Selina’s time spent pole dancing in the short really had me raising my eyebrows. The fact that the short was written by the great Paul Dini and directed by a woman, Lauren Montgomery, did not prevent me from feeling that the scene was more than a trifle too exploitive. Warner can always be counted on to promote upcoming and existing related properties, and as such we’re treated to a Justice League: Doom Sneak Peek (10:17). There is less animation here than on what we can now see in the current trailer available online, but the discussion by the producers and directors, as well as a few of the voice cast, is pretty enticing. The disc also includes Sneak Peeks for All Star Superman (10:47) and Green Lantern: Emerald Knights (11:38). Heart Of Vengeance: Returning Batman To His Roots (23:25) includes interviews with Michael Uslan, Denny O’Neil, Greg Rucka, and more talking about the transition Batman followed in the comics. Moving from the sci-fi camp era to the Julie Schwartz-edited version, to O’Neil/Adams, and finally Frank Miller, it is evident how Batman got darker over the years, until once again more closely matching the original version of 1939. Conversations With DC Comics: Featuring The 2011 Batman Creative Team (39:27) is a misleading title. 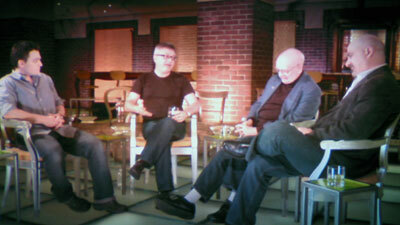 Bat-producer Michael Uslan hosts a discussion with former Batman writer and editor Denny O’Neil, current DC executive Dan DiDio, and current Batman writer Scott Snyder. Though only one gentleman is an actual creator on the current comics, all men do engage in a worthwhile discussion about the influence of Frank Miller and Batman: Year One. The main feature gets a welcome Audio Commentary by producer Alan Burnett, co-director Sam Liu, DC creative executive Mike Carlin, and voice director Andrea Romano. 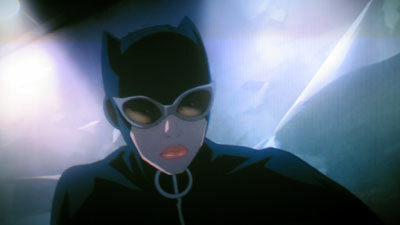 Producer Bruce Timm serves up more of his Top Picks, though I’m at a loss for why they are Catwoman-specific episodes, given her small role in the main feature. 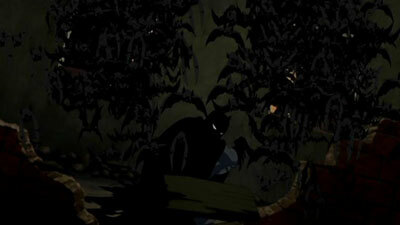 I guess more appropriate “origins of Batman” episodes had already appeared on other DC animated movie discs. The two episodes here are Catwalk from B:TAS, and Cult Of The Cat from The New Batman Adventures. The Batman: Year One Digital Comic Book actually only provides the first 12 pages of the story, out of close to one hundred. Obviously intending to whet your appetite for more, it does serve as a nice introduction to Mazzuchelli and Lewis’ great artwork. The disc actually opens with Trailers for Smallville: The Complete Series, Green Lantern: The Animated Series, and the Web series Aim High. Additional trailers from the menu include those for the DCU Application, the new Thundercats, Mad, and Young Justice. The included DVD, by the way, has a few of the sme trailers plus one for the Arkham City game. 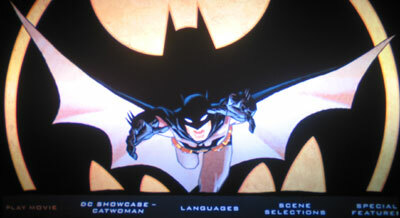 It also has the Catwoman short, all three Sneak Peeks, and the DECU Application trailer. The attractive cover art looks even better in the foil cover slip. The Blu-ray case holds a disc in each side, with an insert offering a code for the digital copy. Warner sticks with a lossless track this time, offering a DTS-HD Master Audio track that provides great impact. Rear speakers could be more active, but the sound is still directional enough across the front. With Gotham City itself being a type of character in the film, one can tell that special attention was given to make the entire city feel alive. And when the action comes in, it rocks the house. Available languages aside from English include French, German, and Spanish. The same options are present for subtitles as well. For some reason, the DVD copy in this set does not have German, but does have options for Portuguese and Thai. What you get here is a wonderful story told in an adult manner, great animation, and solid bonus materials that make up for the main feature’s short run time. I’ll take a great short movie over a drawn-out turkey any day. 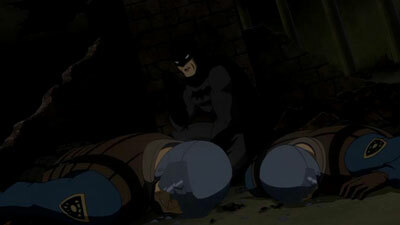 With a reasonable list price, this is one DC animated movie that you should not skip.